Great post,I hadn't ever read comparisons of the "new" and traditional rite of Exorcism. The only thing I knew was that it had been changed. Did anyone to your knowledge ever ask Fr.Amorth why he stayed in the Novus Ordo? No, to the best of my knowledge, Fr Amorth was never asked that question. In some parts of India at Eastertide the parish priest goes around the locality blessing the houses of local Catholics. This year in a certain village the priest when blessing a room in a house noticed a dark figure prancing about. Staring at it he could make out that it had horns and a tail. Whatever prayer/blessing he did the figure disappeared. ( I heard that a family member of this household is involved in the occult ) On the way back to his rectory he sensed that the creature was following him. He began to see the demon roaming around the church premises. The priest's health collapsed and ( I was told ) he suffered a heart attack. He has been replaced as the parish priest. I briefly met this man once. He is of course ordained in the New Rite and he was using the New Rite's Book of Blessings. Of course, there is no way to verify this story. It would serve to prove the poor man was suffered (at least in part) for lack of a valid ordination and efficacious Rite of Exorcism. I would like to know the success rate of novus ordo presbyters. "If the FSSP & ICKSP aren't valid due to new rite bishops who 'ordained' these men,why are their exorcisms successful?" Now I have no idea if their exorcisms are successful and I hold these men to not receiving holy orders nor being priest's. With that said its an interesting question. I think you hit the nail on the head; how do we know the exorcisms were valid? There's no way to accurately discern true posession and who (if anyone) was delivered. That being said, couldn't a demon leave to make a "priest" seem valid and keep them in the false Vatican 2 sect? Yes that's a great insight,hadn't thought of that before. As I understand it once a man is validily ordained he receives an indelible mark on his soul forever as a Priest in the order of Melchizedek. You present several issues which need to be addressed. 1. The character of the priesthood, validly bestowed, lasts for all eternity. "Tu es sacerdos in aeternum"--- Thou art a priest forever. Three sacraments bestow a character on the soul that can never be undone; Holy Orders, Baptism, and Confirmation. Fr. Amorth was validly ordained in the 1950s so he will always be a priest in time and eternity, heretic or not. 2. If someone (Abp. Lefebvre) mistakes a heretic for a pope (whatever the reason) but rejects his heresy and is not in actual communion with him because of those errors, he remains a Catholic. 3. Those who attend the Novus Bogus accept the false teachings of V2. They are not Catholic but members of the V2 sect. They are in actual union with Francis. The "recognize and resist" position of Lefebvre, while illogical and dangerous, does not make one non-Catholic. I call them pseudo-Traditionalists---those who in the words of Fr Cekada----are really sedevacantists but just don't realize it yet! To the comment directly below Lord Belish, you are correct. You stated above that the "character of the priesthood, validly bestowed, lasts for all eternity". Could you tell me if that is what Romans 11:29 refers to? "For the gifts and the calling of God are without repentance". ". According to the gospel, indeed, they are enemies for your sake. That is, enemies both to you, because they see the gospel preached and received by you, and enemies to God, because he has rejected them at present for their wilful blindness: yet according to election, God having once made them his elect, and because of their forefathers, the patriarchs, they are most dear for the sake of the fathers: for the gifts and the calling of God are without repentance, in as much as God is unchangeable, and his promises, made absolutely, cannot fail." It deals with the Gentiles and Israel not Holy Orders. Thanks. I always come away from your website learning something every time I visit!! Glad I can be of service to God in helping others know the truth,Joann! "John Paul 2 is a great help during exorcism the Demons don't like him." Well in response Demons hate everyone literally so,that isnt some big revelation. It's frustrating reading and hearing all of these stories because nothing can be confirmed. I agree. It's a sign of the times when if possible, "even the elect would be deceived." God bless you my friend! I don't consider JP2 a Pope nor a Roman Catholic. The interview with Fr.Amorth I was referring to made me question his accounts of JP2 "helping destroy the Devil's plans." If anything JP2 helped Satan in numerous ways. You're correct. I have no disagreement with what you've just stated. Have you read Fr. Amorth's book "An Exorcist Tells His Story (Ignatius Press, 1999)? On pages 173-174 he wrote: "I know that John Paul II has performed at least two exorcisms." Henceforth, I will just refer to myself as Two. The exorcisms could be staged to make him seem legitimate. He has the power of exorcist by virtue of Orders. To simulate it on two occasions to further the cause of Satan is not implausible. This is my conjecture. Why Fr Amorth didn't see him (Wotyla) for who he was (worshipping with animists) baffles me. 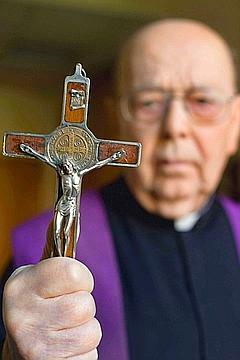 For exorcisms, the best expert was the late Traditionalist Bishop Robert McKenna. I hadn't realized the book is a translation of the twelve Italian edition of 1994. It's curious that it doesn't mention the first edition's publication date. If one assumes at least 2 years for every edition, the first could have been in 1970 or earlier. Skipping around I found inconsistencies which might be attributed to changes in his thinking because of Vatican II. He seems to alternate between a traditional understanding and one informed by Vatican II. For example, he wrote this about the increase in the influence of evil and demonic possesions: "We can see the proliferation, especially among the young, of spiritism, witchcraft, and the occult. We can add to this the pursuit of yoga, Zen, transcendental meditation: these are all practices based on reincarnation, on dissolving the human person into divinity, or, in any case, on other doctrines that are unacceptable to Christians. We do not need to go to India anymore to find gurus; we can find them at our doorsteps. Often these apparently innocent practices bring about hallucinations and schizophrenic conditions. To this I can add the exponential proliferartion of many sects, many of which bear a distincly satanic mark" (pages 53-54, Exorcist Tells His Story"). But later (p. 160) he discusses "prana" therapy', and seems to be against it, yet also writes: "...I have known some truly selfless prana therapists, people of faith, who make their gifts available as a service to others in a spirit of true charity." Then he adds: "Unfortunately they are extremely rare -"two for every thousand" - a renowned Venetian exorcist Father Pellegrino Ernetti, told me, validating the caution with which we vview prana therapy. It is by accurately discerning the fruits and methods that we recognize the tree." And on page 155 he writes: "I want to stress briefly what the Second Vatican Co8uncil recommends but is not always followed. Rationalism and naturalism took over this ground: extraordinary manifestations, miracles, the presence of saints, apparitions." "I do not know why we have shortened exorcisms. I am not sure it was very realistic or fitting. Still the exorcism is there." At that point Father Amorth commented in a parenthesis between the send and third sentences: "I want to call attention to this public and obvious dissapointment of the Pope, with which all exorcists agree." ---"An Exorcist More Stories", Ignatius Press, 2002, translated from ninth Italian edition, 2000, first ed. 1992. p. 67; speech pp 64-72). Paul VI was against the shortening of which ritual? As things stand now, I don't see that one can reconcile JPII, Benedict XVI and Francis with what the Church has always taught. I don't see myself in communion with them. Any comments on any of the quotes? Also, what do you think is the value of other religions, prior to their exposure to Christianity, if any? It's after midnight on Saturday.. So I'm not expecting an answer on Sunday anytime soon. I'm sure you understand (if you've been a Traditionalist for at least a few years--I've been one since 1981) that there are certain clergymen you can't figure out. They live a dichotomy, and I don't pretend to know how or why some of them do it. For example, I knew the late Fr. Paul Marx of Human Life International. His writings and publications on abortion, birth control, marriage, and virtually any other topic of morality on which he opined was 100% orthodox. It could have been written by Pope Pius XII himself. Father was ordained in 1945; he was well-educated and there was never any hint of any scandal. He was a decent person, and I can attest to that fact. YET, Fr. Marx used the Novus Bogus "mass" recognized the post-V2 "popes" and accepted Vatican II, which ultimately negates everything he was working to accomplish at Human Life International. Fr. Amorth is like him. He's an enigma, saying some truths and accepting some falsehoods. I stick with the teachings of Bishop McKenna on exorcism. One incident was allegedly reported by Malachi Martin (who was not on our side as far as I'm concerned), and several others regarding an attempt (circa 1940) by Pope Pius XII with all the Vatican cardinals and exorcists in trying a "long distance exorcism" on Adolph Hitler. Fr. Amorth was ordained in the 1950s , but must have known of this incident (if true). Maybe that's why he claimed hitler to have been possessed. That's one question I would have loved to ask him. Don't worry about typos; you don't want to spend time checking your work like me. Unless it's egregious, I get it. Here is a corrected version of my previous post. But if in your sole discretion it's going to cause more confusion than help, there is no need to publish it. I hadn't realized the book is a translation of the twelfth Italian edition of 1994. It's curious that it doesn't mention the first edition's publication date. If one assumes at least 2 years for every edition, the first could have been in 1970 or earlier. Skipping around I found inconsistencies which might be attributed to changes in his thinking because of Vatican II. He seems to alternate between a traditional understanding and one informed by Vatican II. For example, he wrote this about the increase in the influence of evil and demonic possessions: "We can see the proliferation, especially among the young, of spiritism, witchcraft, and the occult. We can add to this the pursuit of yoga, Zen, transcendental meditation: these are all practices based on reincarnation, on dissolving the human person into divinity, or, in any case, on other doctrines that are unacceptable to Christians. We do not need to go to India anymore to find gurus; we can find them at our doorsteps. Often these apparently innocent practices bring about hallucinations and schizophrenic conditions. To this I can add the exponential proliferation of many sects, many of which bear a distinctly satanic mark" (pages 53-54, Exorcist Tells His Story"). But later (p. 160) he discusses "prana" therapy', and seems to be against it, yet also writes: "...I have known some truly selfless prana therapists, people of faith, who make their gifts available as a service to others in a spirit of true charity." Then he adds: "Unfortunately they are extremely rare -"two for every thousand" - a renowned Venetian exorcist Father Pellegrino Ernetti, told me, validating the caution with which we view prana therapy. It is by accurately discerning the fruits and methods that we recognize the tree." And on page 155 he writes: "I want to stress briefly what the Second Vatican Council recommends but is not always followed. Rationalism and naturalism took over this ground: extraordinary manifestations, miracles, the presence of saints, apparitions." "I do not know why we have shortened exorcisms. I am not sure it was very realistic or fitting. Still the exorcism is there." At that point Father Amorth commented in a parenthesis between the second and third sentences: "I want to call attention to this public and obvious disappointment of the Pope, with which all exorcists agree." It's after midnight on Saturday. So I'm not expecting an answer on Sunday or anytime soon. To continue our discussion, let me say a little about myself. My First Communion was kneeling down in a traditional Catholic mass circa 1962. But the seed of faith was nourished by my grandfather since as far back as I have any memory. And although I was very devout as a child, I effectively left the Church in the late 60's, came back in the early 70's, and left again in the mid 70's, but not because of Vatican II. I again returned to what I thought was the Church in mid 2001 by the grace of Our Lord, after an experience that I am certain was of supernatural origin. But I did not make the distinction between traditionalist and novus ordo for most of the time since my return. My focus was the Holy Eucharist. I came back with the pre-Vatican II faith I had as a child but supernaturally invigorated by this grace I had received. I accepted transubstantiation. I am certain of it. But the abuses I witnessed over the subsequent years were astonishing. Having said all of this, please note that although I am no longer in communion with Francis, Benedict XVI and JPII, I consider the novus ordo consecration valid. The reason I don't go to any novus ordo mass is that I can't honestly pray to God in communion with Francis, and with those in communion with him. But I don't go to traditionalist masses because they deny Christ's presence in the Novus Ordo consecration, and so I am not in communion with them, for that would be to deny Christ. In addition I have doubt about the Thuc ordinations. Christ's institution of the Eucharist was extremely simple, and I see that, and not the subsequent traditional mass, as the foundation. But, at this time, I don't know of any priest, traditionalist or not, that I'm ready to trust and whose faith I can endorse without reservations, although I don't mean to say there aren't any. In any case, now that you know a little more of my position, please let me know what you think of the Paul VI's quote in my previous post. He sounds quite like he should, doesn't he? What are 1 to 3 objections which you are certain make him a heretic? Lumen Gentium? Which specific sentences in Lumen Gentium? I'm undecided about him. Please see my post of 2/29/15 and my post of 1/24/13 regarding "Paul the Sick." He signed the heretical decrees of V2 and was a sodomite who put the "Gay Mafia" in place. If you believe the Novus Bogus as valid you must accept the V2 sacraments with their false theology, defective intentions, matter and form. You do not "deny Christ" by denying a valid Eucharist EVEN IF mistaken. To have good theological grounds for rejecting it in the V2 sect's buildings does not mean you deny Transubstantiation or the Real Presence. The Traditional Mass was the fruit of the guidance of the Holy Ghost. Pope Pius XII condemned those who wanted to return to the way Mass was offered in earlier times (Mediator Dei). Introibo, you are a true son of your father, like they say in Africa here. Please write more. I am sorry to persist on Abp. Lefebvre. I stated elsewhere that he was a heretic but many denied it without giving me a satisfactory answer. Please state clearly for me: was Abp Lefebvre a heretic? He signed Vatica2 documents, accepts the novus ordo orders and mass as valid, so not completely rejecting John Pal IIs errors? I promise to rest. Please give me 48 hrs. to formulate a reply. I want to have time to explain as best I can. Your questions are always welcome here! This is a difficult question, and I have never held myself out as a theologian. What follows are two possibilities and my personal opinion; nothing more. 1. In order to be a heretic, one must deny "A teaching which is directly contradictory to a truth revealed by God and proposed to the faithful as such by the Church." (See theologian Parente, Dictionary of Dogmatic Theology, Bruce Publishing Company, , pg. 123). 2. Did Archbishop Lefebvre commit heresy? (a) It can be argued he did (at least materially) because of the documents he signed. (b) He repented, and abjured this mistake, and since there is no pope to receive his formal abjuration, his public rejection of these V2 errors made him formally Catholic even if he had been materially a heretic. (i) He did not sign two of the documents believing them "irreconcilable" with past teaching and were in error as they were written, if not formally heretical. He believed that the others could be "reconciled" with past teaching, and were not heretical. (ii) This was a unique situation; sedevacantism was not well understood by most. If "Pope" Paul VI and the majority of bishops approved of these documents he had the duty to go along because it had "papal" approval. (iii) There was no intent to deny any tenet of the Faith; he was not obstinate. As soon as he realized the heresy, he repented of going along. (iv) Since there was no intent to deny any article of Faith, and he believed the documents (except two) were capable of a correct, orthodox interpretation since they were promulgated by a man he (wrongly) thought to be pope--these extraordinary circumstances excuse his act of signing the documents. I believe the first is the more probable opinion. The rest is not really a problem. Mistaking the person of the pope is not heresy. His acceptance of the Novus Bogus was QUALIFIED that it "could be" valid in certain circumstances. He rejected it, entertained sedevacantism, and while "recognizing" the Modernist Vatican, totally rejected their errors and refused to be in formal communion with them. The Archbishop was a good man who lived in difficult times. He may be guilty of material heresy because of the extraordinary circumstances, but he recanted soon thereafter. Speaking as a traditional Roman Catholic (sedevacantist) I think Archbishop Lefebvre was doing the best he could in an early stage of the apostasy during the pre-internet era. Information was hard to obtain,both lay people and Clergy were in the dark on the Anti-Pope actions,words,and deeds. I hold Archbishop Lefebvre in high esteem.Him and his order were among the first generation of Remnant Roman Catholics keeping the true faith alive. I am in full agreement with you! The early Church had laity performing exorcisms. Technically any member of the Church can perform one, but the Church regulated them by restricting them to the clergy as things got out of hand. Perhaps then, the FSSP could perform them sucessfully. Since the ecclesial law restricting them to the clergy could not have foreseen such times as this, then the Divine Law given in Mark 16, that believers would cast out demons, without the distinction between lay or clerical state, is still in force, even if the Church law is currently suspended due to the extraordinary unforseen situation. It may be likened to supplied jurisdiction for confessions. This does not mean anyone can now go out and do them, and one would be playing with real fire if one tried. By the way, Fr Amorth supported the Medjugorje apparitions at one time. I am not sure if he retracted this position. He was still able to perform exorcisms as he did them in persona Christi. Very interesting, Mike. I wasn't aware of Fr. Amorth's support for those phony apparitions. I agree with your assessment on exorcism. The order of exorcist is the third of the four minor orders on the way to the priesthood. They are non-ordained men. You are very correct that this does not mean the laity should go around performing exorcisms and confront that kind of evil. Traditionalist clergy should be sought out---and they use the traditional rite of exorcism that actually works!